This unique building is so famous, the Czech National Bank issued a coin featuring its likeness in 2005. It was the final piece in the bank's '10 Centuries of Architecture' series. 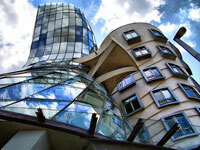 Designed by Croatian-born Czech architect Vlado Milunic together with renowned Canadian architect Frank Gehry, the building was originally named 'Fred and Ginger', as it looked like a man and a woman (Fred Astaire and Ginger Rogers) dancing together. The building was designed in 1992 and completed in 1996. It is constructed from 99 concrete panels, each differing in shape and dimension and, consequently, requiring a unique wooden form. The building is a popular tourist photo opportunity. The Dancing house was controversial in the past, with some thinking it contrasted too starkly with the Art Noveau style of buildings in its neighbourhood. However, over the years it has become a well-loved and supported landmark in the city, receiving worldwide praise for its innovative design and originality. Also, the Dancing House was built on a significant site, replacing a building that was destroyed by bombing during World War Two. The design is meant to be symbolic of the changes undergone by the Czech Republic from communist regime to parliamentary democracy.